Several SNU graduates have taught abroad in countries such as Spain, Germany and various other countries in Latin America. Some of these are planned, but others took a chance to leave their comfort zones. These are great opportunities to not only explore the world, but grow as a person because of facing difficult situations. Stephanie Reyes, an SNU graduate, decided she wanted to teach abroad two years before her graduation. 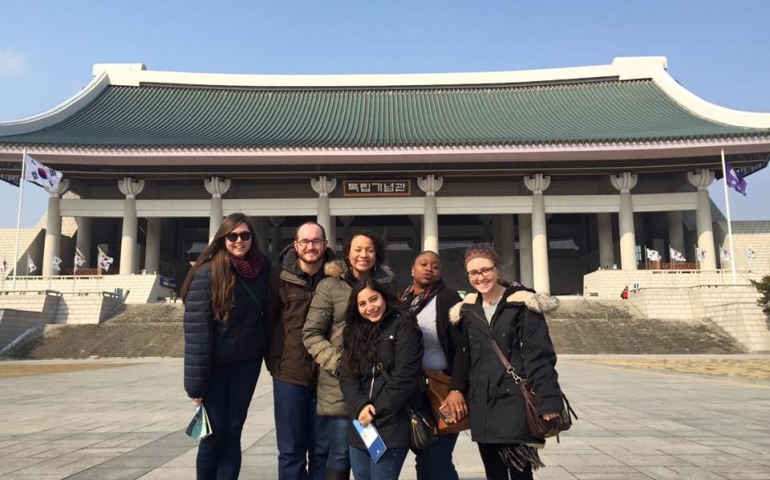 She says, “I had friends in South Korea who went to Southern Nazarene University who gave me some information about the program they were in.” However, Niya Smith, also an SNU graduate, didn’t pursue teaching abroad until two years after graduating. Reyes also agreed that she enjoyed the students but pointed out some other interesting aspects of her occupation. She articulated that in Korean culture teachers are highly respected and quality time with coworkers is considered extremely important. She plays volleyball with her school every Wednesday and will sometimes have dinner with coworkers. However, not everything has been so welcoming or easy for these teachers. Both discuss some of the struggles they have encountered living abroad in a different culture. “Being different in a homogenous country can be tough, but it teaches you a lot about yourself and what all you can take and learning how to open your mind towards numerous closed minds,” Smith explain. She points out circumstances “Like staring or having people randomly touching me,” and how difficult it can be to not react in a negative way. Smith said she is a person who enjoys her space and that she struggles to find some as the culture’s definition of space is vastly different from hers. Despite some of the setbacks they have faced, both teachers have felt a change in their life. Open to conversations she would not have had before, Smith learned how to engage in viewpoints she would have previously shut out. Being so far away from family and having to make new friends, was the most challenging aspect for Reyes. However, they still advise students who are thinking about teaching abroad to go ahead and do it. “Don’t get stuck being comfortable. Move from that town you’ve been in your entire life (it will still be there years from now and probably stuck in its ways) and discover a new sense of freedom and self-discovery. Challenge yourself and your views,” stated Smith. It can be scary to begin thinking about the future, but it is going to happen. Why not try to take the scary leap? Go travel to another country and live there for some time. It could be the greatest choice you ever make.